Eurozone finance ministers meet in Dublin on Friday to finalize Cyprus bailout amid news that the country needs much more money than previously thought. The meeting will review how Cyprus can raise its contribution to the bailout being put together by the EU and IMF. The cost of the rescue has risen to 23 billion euros ($30 billion) from 17.5 billion euros, according to Cyprus’ creditors. Meanwhile, Cyprus has loosened the capital controls it imposed last month. In order to secure 10 billion euros from the EU and IMF, Cyprus will have to find the remaining 13 billion euros, 5.5 billion euros more than previously thought. The finance minister of Luxembourg, Luc Frieden, said on Friday that Europe and the IMF could not increase their 10 billion euro share of the bailout. “I believe the policy will be that the volume will remain at 10 billion [euros],” he told a German radio station. Late on Thursday, a Cypriot government spokesman confirmed that one fundraising option being considered was the sale of some of the country’s gold reserves. “The Cypriot government put various options forward, including this,” Christos Stylianides told a news conference. Christos Stylianides blamed the gulf between the original bailout total and the new 23 billion figure on the previous administration and the time it took to negotiate a bailout, delays which pushed the cost of recapitalizing its banks much higher. He accused former President Dimitris Christofias of failing to “take responsibility, and complete indecisiveness” in promptly negotiating a bailout. Analysts said the increase in the cost of the bailout meant Cyprus faced huge new challenges. Under bailout terms agreed in March, depositors with more than 100,000 euros in savings will bear part of the cost of the rescue. 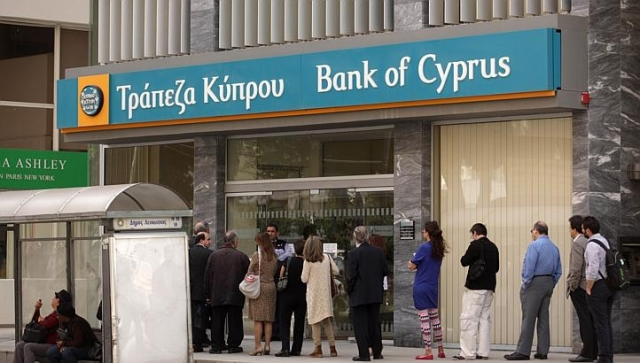 The bank sector on which much of the Cypriot economy was dependent is shrinking, and thousands of jobs are being lost. Laiki Bank is being wound up and its healthy assets transferred to the Bank of Cyprus. Late on Thursday, Cyprus relaxed restrictions that were imposed last month on access to accounts in order to head off a run on banks. The capital controls, the first that any eurozone country has applied, were put in place when banks reopened on March 28 after they were closed until a bailout agreement. A new decree, which will remain in place for seven days, lifts all restrictions on transactions under 300,000 euros, a move aimed at helping cash-starved domestic businesses which had difficulty paying suppliers and employees. Also, the daily limit on transactions outside of Cyprus not requiring prior approval is raised from 5,000 to 20,000 euros. However, the daily cash withdrawal limit of 300 euros stays in place. Meanwhile, eurozone officials at the meeting are also due to review Slovenia’s growing problems. There will be no discussion at the meeting of finance ministers, and the country will not make an application for bailout funds. But Slovenia’s finance minister, Uros Cufer, is expected to present to EU and European Central Bank officials his plan to shore up the country’s finances. Slovenia, which adopted the euro single currency in 2007, has been forced to recapitalize its main banks and the economy is struggling.